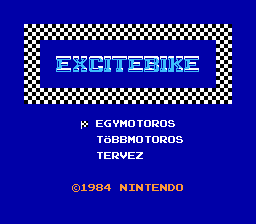 Early NES/Famicom motorbike racing game. 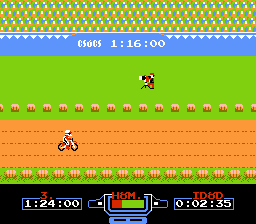 The player guides a biker through a four-lane obstacle course. Scattered throughout the course are large hills, puddles, ramps, and grass patches. On the screen below is a temperature gauge for the bike. Using turbo causes the bike to begin to heat up. If the bike overheats, the biker is forced to stop and wait for the bike to cool off before continuing the race. There are three game modes. Selection A is a solo race. Selection B is a race against three computer bikers, Design is the highlight of the game where players can create their own courses. 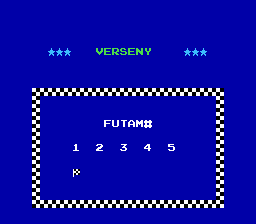 The Japanese version of the game allowed players to save their courses with the use of the extremely rare Famicom Data Recorder.